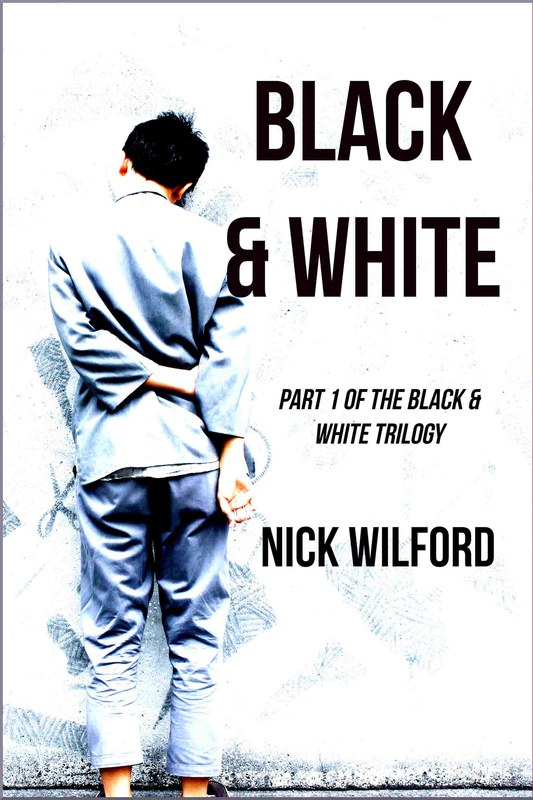 I am happy to introduce Nick Wilford, a ‘new to me’ author sharing an interesting interview and a book that sounds like a great read! Hello, Nick…welcome! Please tell us a little about yourself, where are you from? Where do you live now? Family? Pets? I’m originally from Brighton, England, but moved to Glasgow, Scotland in 2003 to study journalism. As I enjoyed writing, I figured it would be good to pursue a career that involved doing it on a daily basis. I met my wonderful wife the following year, and since then I haven’t looked back! I’ve got one daughter, Eve, and two stepdaughters, Hannah and Emma. My stepson Andrew, who sadly passed away in 2013, is now our guardian angel. We’ve also got five boisterous pups who keep us on our toes – Pippa, Rudi, Tobi, Charlie, and Benji. Where did you get the idea for Black & White? My book is all about an ideal, disease-free society that has a darker side. There’s no dirt, and the initial idea came from a passing thought I had about how much more I could get done if everything stayed clean all the time – but it developed into something much bigger. I have written speculative fiction, with a previously published novella that was set in contemporary times, but this is the first time I’ve written a dystopian. I wouldn’t say I chose that genre though, it was just what seemed to most closely fit the genre. I used NaNoWriMo twice when writing this series – the first time in 2012 to start the first book, and the second time in 2014 to finish the draft of the second book. That latter occasion was the only time I’ve won! I’m tempted to say the title; that always seems to be the most difficult for me. With this series, however, I sat down and brainstormed one day, went out to walk the dogs, and came up with titles for the whole series! With this book, the society had a complete reset of history when the ruling party came into power; in other words, they deleted everything that came before, for their own nefarious purposes. I constantly had to bear in mind that there were certain things the characters wouldn’t know, and even phrases they wouldn’t say. Yes, I’m a full-time freelance editor. I definitely enjoy it, as it takes a lot of brain power, it keeps me engaged when I’m not writing, and I learn things from it all the time. I love getting up early to write – like 4 a.m. early. It’s perfect for me because I get pretty much total peace and it’s almost a magical time – it’s hard to write during the day because we’ve got a pretty crazy house with kids and dogs making plenty of noise. I find it really hard to sleep in late any more, and usually that’s not an option because the dogs want to get up anyway! My first job was a paper boy – I did that from age 13 (well, a week before my birthday, which was technically illegal) up to nearly 17. It got me used to early starts, because I now get up before work to write (and work starts at 6am). I also get to tell people that I’ve always worked with words in some form! What do you want readers to come away with after they read Black & White? I hope that it will make readers think about issues of acceptance. Our society doesn’t seem to be getting any better in that regard, only worse. It’s still hard to believe that someone like Donald Trump can be president – and in the UK, we’ve had Brexit, which many voted for out of xenophobic reasons. None of that had happened when I started writing this, but I think it’s made it more relevant. There’s also the idea that it’s possible for one person to make a difference, which is inspiring. That’s a tough one. Is it better to have a strong adverse reaction or one of indifference? I would hate for anything to write to be greeted with “meh”. If it’s a less favourable review that has some constructive criticism, something to build on, then I’ll take it. I would love to try my hand at a historical one day, because history is a passion of mine. It would mean a lot of research, of course, and I’m always impressed by authors who go to great lengths to make sure everything rings true. An alternate history is something that’s quite appealing, because it contains greater scope for invention. What character in your book are you least likely to get along with and why? Probably Ezmerelda, one of my two young teen protagonists. She’s very smart and matter-of-fact, and she’d probably get annoyed with me for failing to keep up with her speed of thinking! The first proper things I wrote were sketches for my drama club at school. I had an idea about being some sort of comedian, and even started writing a TV sketch show with a friend. I still like to have some element of humour in my writing, even with a story that can appear quite grim, but I soon realized that I’m more comfortable staying behind the screen than trying to perform for others to see! My favourite author is Terry Pratchett, and what I like about his work is that, even though it takes place in a fantastical world, it features characters you can relate to and recognize and even messages that are relevant to issues that affect us. That side of it has a large bearing on some of my own work, particularly this new series. My favourite band is Mansun, and my favourite album of theirs is Six, which I’m actually listening to as I write this. It’s an amazingly creative cocktail of musical ideas and lyrical thoughts, some of which overlap each other, but you can make out of it whatever you want. It’s like a haunting dreamscape and inspires me a lot. I went backpacking when I was younger and visited Uluru in Australia. It was a breathtaking sight, especially watching the sun go down behind it and the sky sift through changing shades of pink and orange into black. Getting to climb up it and sit on top was cool too! I’ve always wanted to see the pyramids and Sphinx in Egypt and still hope to get there some day. My favourite program as a kid was Red Dwarf, about the last survivor of the human race who is stranded on a spaceship 3 million years in the future, with a hologram, a robot, and a humanoid creature who evolved from his cat as company. It’s brilliantly observed character comedy, with some neat sci-fi concepts in there as well. Well, actually my favourite show is Red Dwarf. I’m kind of stuck in my ways! But The Big Bang Theory is something that I’ve really enjoyed recently. Which do you prefer: Board games/card games or television? We don’t play board games as much as we watch TV, so I’d have to say I enjoy them more as they’re more of a treat. They do bring out my competitive side a bit too much though! Thank you, Nick…I enjoyed learning more about you. I am so glad you joined me today! Do you enjoy speculative fiction? Is there a particular type that you prefer and why? I’ll pick the winners after the tour. The prizes are three e-copies of my collection A Change of Mind and Other Stories and a $10 Amazon giftcard. At first no one could explain how the strange boy came to be there in the middle of the street. One minute it was just the gleaming and silent hovercars, the next minute there he was, like a blot on the landscape. One of the vehicles bumped him as he materialised, but it didn’t seem to bother him. That, at least, was no surprise to the crowd of onlookers who quickly gathered around this curiosity. Mallinger was a sight unlike any ever witnessed by the citizens of this unnaturally clean city. Black streaks of grime marred what would otherwise have been an appealing face. His brown hair hung shoulder-length, lank with grease, and seemed to contain things that were… alive. And his clothing seemed to be one loose thread away from falling apart: he wore a grubby tunic that could have been white in a different millennium, a brown waistcoat that seemed to be made from some sort of muslin cloth, and ill-fitting britches worn to a shine not just at the knees, but over their entire surface. All were just as dirty as the boy’s face and other areas of skin that could be seen through the various holes in these garments. But of course the onlookers had no words for things like “dirt” and “grease”. The boy seemed just as alien to them as a visitor from the planet Zarglemoof, a place of which they also had no concept, being outside the confines of the land of Harmonia. The lad was shielding his eyes, as if blinded by his surroundings. Nonetheless, he became aware of a tall and officious-looking man in front of him, who gave the impression of being in charge. He wore an immaculately tailored suit and bowler hat, which were – like all the other citizens’ clothing – all white. “Where did you come from, boy?” His tone was not unkind. The boy kept his eyes fixed on his threadbare shoes, as if trying to anchor himself in this unfamiliar environment. “Fusterbury,” he managed at last, in a voice which seemed too guttural and deep for a boy of his size. “Hush!” said the man. “I see no grounds for such an accusation. Bio: Nick Wilford is a writer and stay-at-home dad. Once a journalist, he now makes use of those early morning times when the house is quiet to explore the realms of fiction, with a little freelance editing and formatting thrown in. When not working he can usually be found spending time with his family or cleaning something. 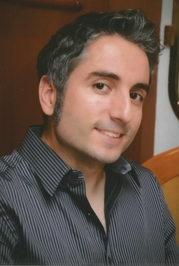 He is the author of A Change of Mind and Other Stories, a collection featuring a novella and five short stories, four of which were previously published in Writer’s Muse magazine. Nick is also the editor of Overcoming Adversity: An Anthology for Andrew. Thanks for hosting me on my tour today! The interview was a lot of fun. I need to let you brainstorm my next book title. Or loan me your dogs. I enjoy writing science fiction the most, but when it comes to reading, fantasy is usually my first pick. Five dogs – wow! That sounds like a lot of energy running around the house 🙂 I was just talking with some friends about Red Dwarf the other day. Funny to see it pop up here. I just love the premise for this book. Great excerpt! Visiting the pyramids would be cool! I love the concept. I can’t wait to read it. I lean toward no review. but bad reviews are life, so no need to be a whiner about it. And they are useful. It’s a great way to learn some hard truths sometimes. Alex – OK, as long as there was no deadline on the title! I’ve read more sci-fi than fantasy lately, but I’d like to redress that. Ellen – Yeah, it’s never a dull moment here! Did you know they are still making Red Dwarf? Sheri – Thanks! Hopefully I’ll get there soon. Hilary – Yeah, I’ve been around a bit I suppose. Glad I could fill in some gaps! Elizabeth – Thank you! You have to take bad reviews as being inevitable, like rejections. Oh, ‘Red Dwarf’. Excellent choice. Fun interview, though I’m so sorry to learn you lost your stepson, Nick.